The skyline to the south of Middlesbrough is dominated by a long, green, wooded slope stretching all the way from Wilton Castle to the rocky outcrop and cluster of radio masts at Eston Nab. This is Lazenby Bank, a beautiful and varied woodland; much of it under ash and oak trees, but also including plantations of beech and chestnut. There are swathes of bluebells and pretty patches of wood anemones to enjoy in spring. Despite its close proximity to industrial Teesside, the woodland is a quiet, natural sanctuary for wildlife and visitors. After leaving the lay-by on the A174, close to Greystones roundabout, an old trackway “Sandy Lane” leads you up to the woodland. 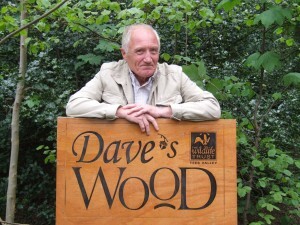 The first plot you arrive at, covering some 26 acres of Lazenby Bank, has been named “Dave’s Wood” in honour of Dr Dave Counsell, a trustee for 19 years who, through his role as an environmental manager at Cleveland County Council, had been instrumental in the Trust’ s formation in 1979. There are parts of Lazenby Bank which have had uninterrupted woodland cover since early times and which can be described as Ancient Woodland; a rare and irreplaceable habitat. These have evolved complex communities of trees, plants, fungi, microorganisms and insects. Look out for the distinctive white-spotted, red caps of the fly agaric toadstool or specialist molluscs such as the ash-black slug or the rather handsome English chrysalis snail. Lazenby Bank is important culturally, too, having been the backdrop to human activity and settlement over centuries. A Bronze Age barrow and an Iron Age Hillfort have been identified at Eston Nab, while scattered through Lazenby Bank, the visitor can find remains of its iron mining history; cobbled tramways, a bridge with a keystone dating from 1871, the shell of the fan house, known locally as the “SS Castle” from the iron brackets which are keeping the walls upright. This was the site where the 16 feet-thick Cleveland Main Seam of rich ironstone was first discovered. Although the woodland now offers peace and tranquillity, it is not very long since 10,000 miners were working this seam, deep into the Eston Hills and sending millions of tonnes of ore to feed the furnaces which were strung along the banks of the Tees. The steel they produced was used in construction projects around the world, from Denmark to Sudan and most famously, in the Sydney Harbour Bridge. The purchase of this 200 acre woodland and its establishment as a reserve was only made by possible through the generous support of Biffa Award. Biffa Award helps to build communities and transform lives by awarding grants for community and environmental projects across the UK. The fund’s capital comes from landfill tax credits donated by Biffa Group Limited, the leading nationwide integrated waste management business, through the Landfill Communities Fund. The woodland can be reached on foot from the lay-by on the west-bound carriageway of the A174, immediately adjacent to Greystones roundabout. Head east from the lay-by on a surfaced track before turning south onto the Lazenby Bank Road; a bridleway which leads, for just 450 metres, to the entrance to Dave's Wood.